I started using Vue when I started at Tidelift. Before that, I did React and Angular for years. 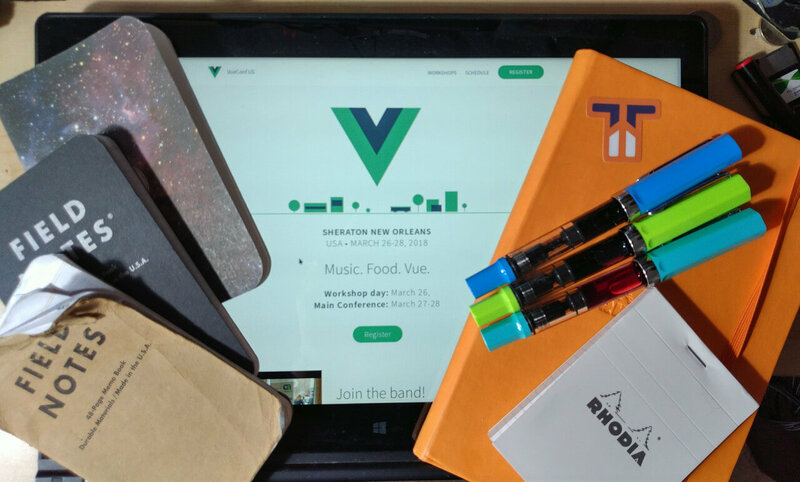 I grasped the basics of Vue pretty quickly, and was excited to learn even more about this framework I now use day in and day out at this year’s VueConf US in New Orleans. 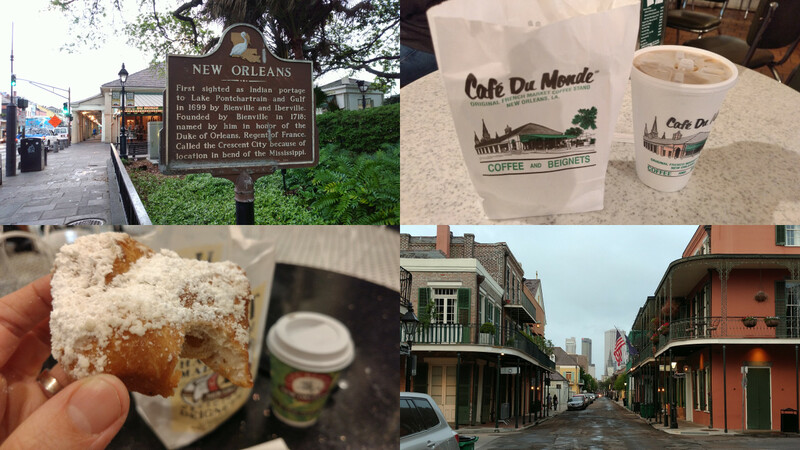 I’d never been to New Orleans, nor a conference focused on Vue, so I didn’t know what to expect—and in both cases, I was blown away. 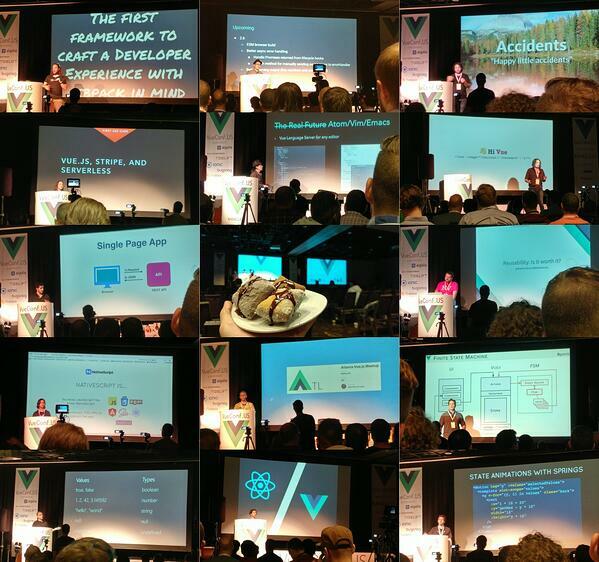 This year’s VueConf US was a single-track conference, which made it really easy to have common topics to discuss with other attendees. I was the only Tidelift developer going, so it was up to me to not only have plenty of takeaways to improve our dependency analysis tool and whatever comes next, but to also get plenty of great content and insights for this very blog entry (and, as a personal challenge, all of my notes were going to be taken with pen and paper, which kept me 100% focused on the amazing talks at the conference). There was also a talk about TypeScript and Vue by Daniel Rosenwasser. I haven’t personally worked with TypeScript, nor do I use VS Code (which was the core of the incredibly cool final talk of the conference by Pine Wu), so if I want to try that out too, I need to make sure the Vim keystroke support is really good. Finally, using Vue with functions-as-a-service by Sarah Drasner was pretty intriguing, more so for me for the idea of functions-as-a-service that I have yet to experiment with personally. There were two talks that hit close to home. 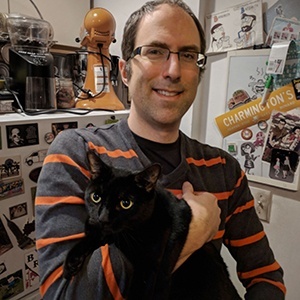 The talk by Jacob Schatz about how GitLab actively avoids rewrites by taking advantage of Vue’s ease of integration into an existing app, and accepting the chaos of an app half in the Vue world and half in another world, is something I wish I’d been able to apply to rewrites of apps I’d been involved with over the years. Finally, as a developer who has gone from React to Vue, the talk on moving from React to Vue by Divya Sasidharan was fantastic and nearly mirrored my own journey during the switch. There were also a ton of awesome lightning talks that hit many diverse topics, so many that I’m looking forward to watching the videos of the talks when they go live. (Unfortunately, I missed a few talks for reasons. Oh well. Can’t do everything.) Finally, for a tech conference, the food was pretty amazing. Those beignets during the afternoon break were killer. If your conference is taking place in New Orleans, at a hotel that’s a stone’s throw away from the French Quarter, of course you’re going to spend your entire downtime exploring one of the coolest neighborhoods I’ve ever been in. While the beignets at the conference were pretty good, they couldn’t hold a candle to the ones from both Cafe du Monde and Cafe Beignet. After the conference, I went with another attendee to the New Orleans Pharmacy Museum tour. If you’re a fan of medical or American history, it’s a heck of a tour. And there’s not much to add about the amazing food in New Orleans. Every place I ate was fantastic, from the hole-in-the-wall diners to the fancy sit-down places. A few of us even hit a jazz show on the last night! Oh yeah, did I mention that we got our own parade? VueConf was a great resource for Vue users of all levels (even those who haven’t even touched Vue yet!). New Orleans is amazing and I can’t wait to get back. 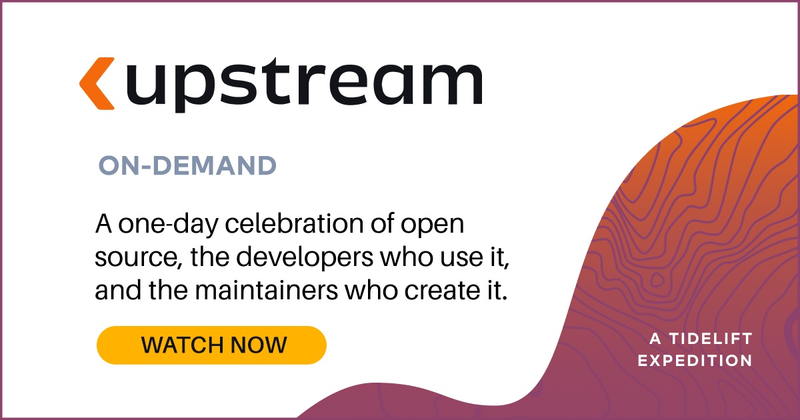 If you missed out on VueConf, Vue Mastery will have all the talks up in the next few weeks for free. If you missed out on New Orleans, get down there and check it out! I know I want to get back there at a time where I can focus all my attention on the food, history, and architecture of this really unique town.